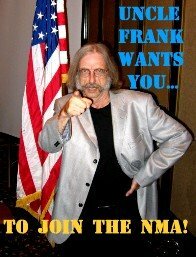 Hard to believe it, but one week from this morning, the 2016 reunion of the NMA will be underway. The first day of an NWA reunion is the shakedown cruise. There's been a lot of planning, and now the plans meet reality. Sometimes it's a smooth introduction, sometimes it involves rough seas. But generally, at 0900 there's an empty room, a collection of music stands and a box of music, and by 1000 there's a big band running down swing tunes. We meet again in the afternoon for concert band, and then again in the early evening for another round of big band. At some point lounge starts filling up and the jamming begins. Any stories that didn't get told during the day are unfurled at the bar. Sometimes the fun goes late, sometimes we tuck ourselves in early, but one thing is for sure: MUs still know how to be on time for morning rehearsal. We're ensemble musicians, not solo artists. We depend on each other. We pitch in to get the job done. And when the workday is over, we get together to shoot the breeze, have a sip or two and jam.